Item 2nd. 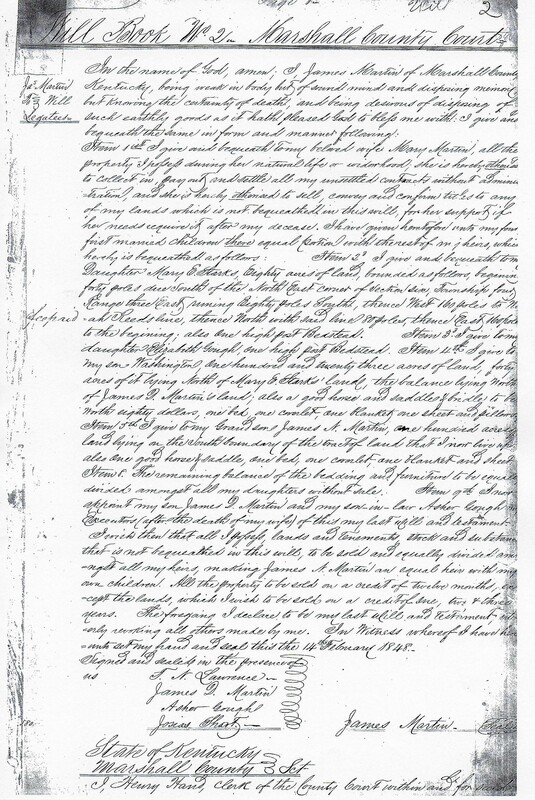 I give and bequeath to my daughter Mary E. Starks, eight acres of land, bounded as follows, beginning forty poles due south of the northeast corner of section six, Township four, Range three east, running eighty poles south, thence west 160 poles to Noah Reed’s line, thence north with said line 80 poles, thence east 160 poles to the beginning; also one high post bedstead. Item 3rd. To my daughter Elizabeth Gough, one high post bedstead. Item 4th. I give to my son Washington one hundred and twenty-three acres of land, forty acres of it lying north of Mary E. Stark’s land, the balance lying north of James D. Martin’s land; also a good horse and bridle to be worth eighty dollars, one bed, one coverlet, one blanket, one sheet and pillow. Item 5th. I give to my grandson James N. Martin one hundred acres of land lying on the south boundary of the tract of land that I now live upon, also one good horse and saddle, one bed, one coverlet, one blanket and sheet. Item 6th. The remaining balance of the bedding and furniture to be equally divided amongst all my daughters without sale. Item 9th. I now appoint my son, James D. Martin, and my son-in-law Asher Gough, Executors (after the death of my wife) of this my last will and testament. I wish then that all I possess, lands and tenements, stock and substance that is not bequeathed in this will, to be sold and equally divided amongst all my heirs, making James N. Martin an equal heir with all my own children. All the property to be sold on a credit of twelve months, except the lands, which I wish to be sold on a credit of one, two or three years. The foregoing I declare to be my last will and testament utterly revoking all others made by me. In witness whereof I have hereunto set my hand and seal this the 14th February 1848. 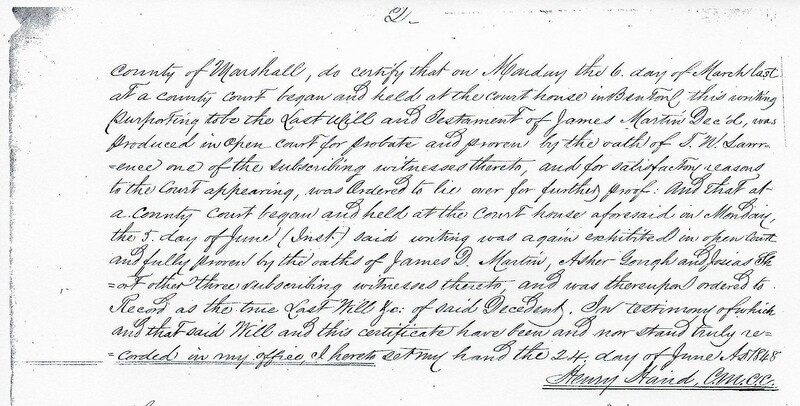 County of Marshall, do certify that on Monday, the 6th day of March last at a county court began and held at the courthouse in Benton, this writing purporting to be the last will and testament of James Martin, deceased, was produced in open court for probate and proven by the oath of T. N. Lawrence one of the subscribing witnesses thereto, and for satisfactory reasons to the court appearing, was ordered to lie over for further proof. And that at a county court began and held at the courthouse aforesaid in open court and fully proven by the oaths of James D. Martin, Asher Gough and Josias Short, other three subscribing witnesses thereto, and was thereupon ordered to record as the true last will of said decedent. In testimony of which and that said will and this certificate have been and now stand truly recorded in my office, I hereto set my hand the 24 day of June 1848.